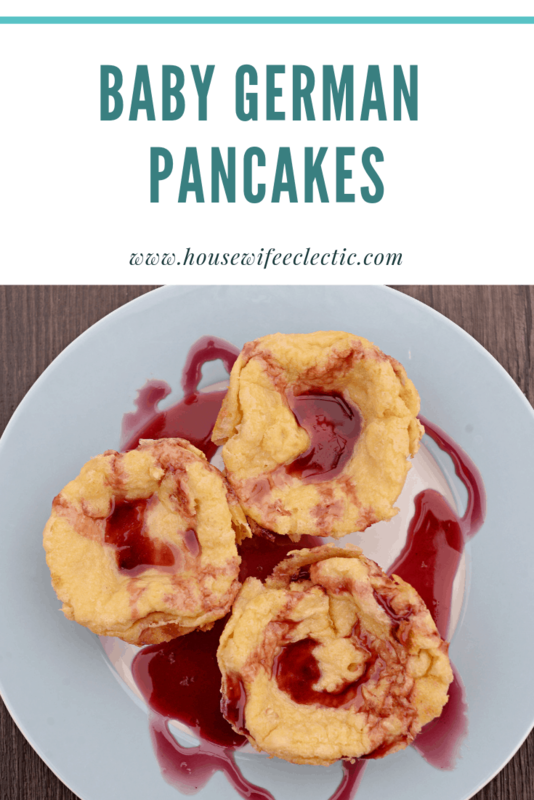 German Pancakes are a nostalgic childhood favorite of my husband’s but I avoid making them. Why? The big ones curl up so much that if you don’t like the crunchy parts, a lot of the pancake is wasted. With German Pancakes, you typically let the butter melt in the dish before adding the batter, making one large pancake. Did you know you can add the butter to the batter so you can make little baby pancakes? Preheat the oven to 400 degrees. Mix everything together but the butter. Mix until there are no lumps. With the mixer going, slowly add the melted butter. Grease a muffin tin well and fill each cup about half way full. Bake for 15 minutes or until golden brown. Pop out the pancakes and fill with your favorite topping. We loved them filled with this frosting. This recipe makes between 18-24 baby pancakes. Oh yeah! Those look irresistible! Yum! This sounds like way less work to me, especially since I am dreadful at spreading the batter and flipping the pancakes. Mark's grandma tries to re-teach me every Thanksgiving weekend when she makes them, to no avail so far.